Frances Lincoln Children's Books, 9781786033314, 32pp. When he was little, Muhammad Ali had his bicycle stolen. He wanted to fight the thief, but a policeman told him him to learn how to box first. After training hard in the gym, Muhammad developed a strong jab and an even stronger work ethic. His smart thinking and talking earned him the greatest title in boxing: Heavyweight Champion of the World. 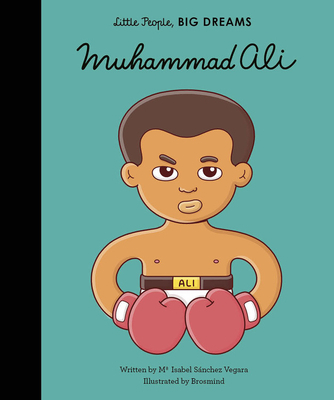 This moving book features stylish and quirky illustrations and extra facts at the back, including a biographical timeline with historical photos and a detailed profile of "The Greatest's" life. Mª Isabel Sánchez Vergara, born in Barcelona, Spain, is a writer and creative director in constant search of new concepts for children's books. Working for more than fifteen years for clients in top advertising agencies, her books combine creativity with learning, aiming to establish a new and fresh relationship between children and pop culture. BROSMIND are the Mingarro brothers, Juan (1978) and Alejandro (1981). They spent their childhood drawing comics, building vehicles for their action figures and shooting movies on home video cameras. In 2006, they founded Brosmind studio in Barcelona. Their style is fresh and optimistic, using fantasy and humor. Currently they combine commercial illustration with personal projects involving multiple disciplines, such as sculpture, music, or video. They have won many awards, including six Cannes Lions.